The food is reasonably priced and very good, especially the enormous "burros." (Apparently, "-ito" means "little"-apply to genitalia at your own risk.) The margaritas could eat a hole through tank armor. Each pitcher fills 3-4 16oz glasses: drink one and you're buzzed; drink four and you're cursing your friends for dragging you away from a leggy, Washington Street "woman. Arrive early: The patio's open 5pm** -11pm, but seating stops at 9:30. The sometimes-brutal competition for chairs can undermine your faith in the social contract. Don't order food while waiting: You can drink inside while waiting for patio seating (sometimes up to an hour,) but you can't take inside food outside. Sit outside at all costs: Inside, service can be insultingly dismissive-which is possibly justified, since anyone too slow-witted to snare a patio seat is obviously a drag on human progress. 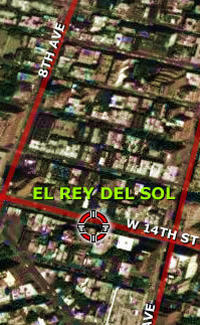 Ultimately El Rey Del Sol isn't just an ideal spot to celebrate some random country's national holiday. It's great anytime you want to achieve a joyous stupor before 10pm. And if you need a holiday for that, you're reading the wrong email. *Independence Day is actually September 16th. Cinco de Mayo commemorates the 1862 "Battle of Puebla," when an undermanned force led by General Ignacio Zaragoza drove 8000 invading French troops back into the ocean. Zaragoza later went on to invent the tequila popper, and was named "Generalissimo of Fun!" **On Cinqo de Mayo the patio opens at 3pm. Tell your boss that your hernia's acting up, then, laughing hysterically, run out of the office four hours early.